We recently received an e-mail from the city about an opportunity to serve on the Noise Review Board. Read on for details. Portland’s volunteer Noise Review Board currently has a position the City is looking to fill. One seat is open for a “Citizen at Large” community representative on the board. The Board is comprised of five members including: three citizen at large positions, a representative from the construction industry, and a professional in the field of acoustics. Appointments to the volunteer Noise Review Board are made for a three-year period. The Noise Review Board normally meets once a month on the second Wednesday evening of the month. The Board is charged with making decisions on Noise Variances for projects that range from nighttime construction projects to large outdoor concerts. The Board also works to develop long term objectives for achieving reduction of sound levels in the community. If you have further questions regarding the Noise Review Board, contact the City’s Noise Control Officer, Paul van Orden at (503) 823-5829. Interested parties are encouraged to file an official application for the City of Portland Noise Review Board and attend a Noise Review Board meeting (next scheduled meeting is February 8th, 2012 at 6 PM). Applications can be acquired from the City’s Office of Neighborhood Involvement. Completed applications should be filed by no later than Friday February 15, 2012 . 3rd Annual Buckman Picnic in the Park, Buckman Community Association. Amount funded: $2000. The Buckman Community Association plans to host its 3rd Annual Picnic in the Park. The goal of the event is to introduce the association board to new and diverse community members, strengthen existing Buckman community ties and to provide a free and fun venue for neighbors from varied backgrounds to meet and build relationships. Funds will support publicity, entertainment, refreshments and other event related costs. Some neighbors are opposed to the Historic District designation, for reasons primarily based around the design review process and associated fees that would come with it. Neighbors who wish to register their objection to the application must submit a notarized objection form. Buckman resident Greg Moulliet is hosting a notary at his home tomorrow, Saturday, January 14th, for anyone who wants to come by, fill out an objection form, and have it notarized. You can find more details and a link to Greg’s website below. What you may not have known is that up until December 1, 2011 the old city e-mail addresses (for example, @ci.portland.or.us) would forward, but after 12/1/11 they no longer do. So at this point it is very important to make anyone attempting to communicate with city staff via e-mail are aware of the new e-mail addresses. We encourage you all to spread the word concerning this to any persons or groups that you know of that communicate with the city in this way. Below is an announcement that we posted on our ONI Website that you may wish to use all of or part of if you want to help us get the word out to interested parties you may be aware of. The City of Portland starting using the new e-mail address format in March 2010, but still allowed messages in the old address format to be received during a long transition period (March 2010 through November 2011). Individuals and neighborhood and community organizations that send emails to City of Portland leaders and staff should check their address books and e-mail distribution lists and update any addresses that still are in the old format. Example: One neighborhood district organization sends out a monthly e-newsletter through Constant Contact. After December 1, they found that all their mailings to city staff were bouncing back. Update the City of Portland e-mail addresses in your address book to be sure your communications get through! Occupy PDX has set up a new office space in your neighborhood, at the St. Francis community use building. We would love to see some of our neighbors there! I am not sure whether you could place some flyers at the next Buckman NA meeting but would appreciate it if you could. The flyer is attached. Come celebrate our new community space! Featuring a panel on Occupy, music, food, workshops, committee booths, a raffle…and fun! Breakout session include tiny-tent making, non-violent resistance tactics & strategies, online activism, kids activities and more! This is a family friendly event. Bring a can of food or a pie! 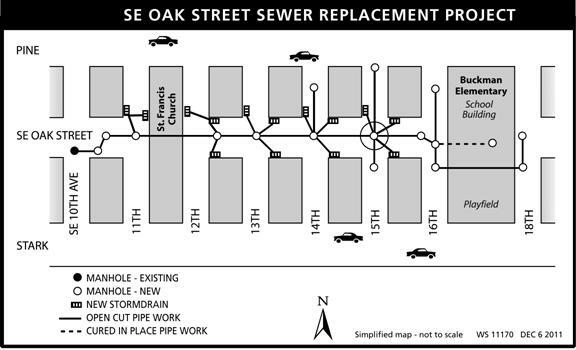 This project will replace sewer pipes which are in poor condition on SE Oak Street from SE 10th to SE 18th avenues and some adjacent streets (see map on back). Construction is scheduled to begin in late spring 2012 and continue through fall 2012. There will be noise, vibration, dust, traffic congestion, temporary parking loss, lane reductions, street closures in the construction zone, and disruption to normal neighborhood activity. You’re invited to a public information meeting on Wednesday, January 25 at the Buckman School Library from 6:30 p.m. to 8:30 p.m. Project staff will present a short overview of the project at 6:30 p.m. Learn the basics of how the City of Portland’s land use and development review process works. Get hands-on experience with a land use review case study, including review of a development proposal and site plan, identification of relevant issues and effective ways to respond to the approval criteria. Introduction by Leah Dawkins, SE Uplift Neighborhood Coalition. Presented by Barry Manning, Bureau of Planning and Sustainability, and Paul Leistner, Office of Neighborhood Involvement. Refreshments will be provided. The workshop is free, but pre-registration is required. Space is limited to 40 participants. REGISTER ONLINE HERE. What does it mean to be a neighborhood land use chairperson? To register online, you need to have a PortlandOnline account. If you do not, you will be prompted to set up an account. Enter your contact information and select this workshop to register. Space is limited to the first 40 people who register. Directions: SE Uplift is located at 3534 SE Main Street, two blocks norht of Hawthorne Blvd, and three blocks west of SE Cesar Chavez Blvd. Auto: Parking is available in the lot located on SE 35th and Madison, behind SE Uplift. Buses: SE Uplift is accessible by Tri-Met Bus Lines 14, 15 and 75. For schedules, call Tri-Met at 503.238.7433 or visit the Trip Planner online at http://www.trimet.org. To help ensure equal access to City programs, services and activities, the City of Portland will reasonably modify policies/procedures and will provide auxiliary aids/services to persons with disabilities. Call 503.823.5284, TTY 503.823.6868 with such requests. Call 7 days advance to request assistance for any accessibility accommodation and/or language interpretation. Limited number of child care vouchers available. Workshop location is wheelchair accessible. SE Uplift Neighborhood Coalition, City of Portland Office of Neighborhood Involvement and City of Portland Bureau of Planning and Sustainability. SE Uplift and the Office of Neighborhood Involvement are pleased to announce the availability of $7,400 in grant funds through the Graffiti Abatement Community Grants Program. Neighborhood, business and community-based organizations are eligible to apply for community-driven improvement projects in the area of graffiti abatement and attempting to repair the harm of graffiti within the SE Uplift coalition area. 2. Include an ongoing impact to the property or area for graffiti prevention and abatement. 3. Positively impact areas/locations with high visibility. 4. Include involvement of youth aged 10 to 21. 5. Help to address practical needs related to the recession such as fixing up run-down homes, businesses, parks, etc. 6. Include volunteers pledging to participate in the project with time and/or in-kind donations. Deadline to apply is Friday, February 24 by 4PM. Grants will be awarded on a competitive basis and may range from $500-$2500. Click here for more information about SE Uplift’s grant program and how to apply. For more information about the Graffiti Abatement Community Grants Program or for technical assistance with your application, please contact Kristen at kristen@southeast.org or 503-232-0010 x 319. We encourage you to apply for your project today! You are receiving this email because you are listed as a point of contact on a Portland neighborhood association website. I am reaching out to neighborhood associations to make sure that Portland homeowners are aware of a ~$10,000 incentive from the City of Portland that is available to homeowners who build accessory dwelling units on their property between now and June, 2013. ADUs are small, standalone houses, sometimes converted from old garages, and sometimes built as new construction, are called Accessory Dwelling Units, or “ADUs”. Building an ADU on a property is neither cheap nor simple, but if you’re a homeowner with an inclination to have an ADU on your property, NOW is a great time to think about building one. Not only does Portland’s zoning code allow ADUs to be developed on most residential lots, but in an attempt to promote more ADUs within city limits, Portland has temporarily waived System Development Charges (which typically cost $7-12K) through June, 2013. Given that we’re now starting our way in 2012, many homeowners are thinking more seriously about building an ADU on their property. If you are a homeowner in the area, maybe you’d like some flexible living space for a family member, or maybe you’d like to have some additional rental income, or maybe like me, you actually want to live in a smaller space that you built yourself and rent out the larger house. It’s also notable that building an ADU is one of the most ‘green’ decisions you can make for your city. Last month, Energy Trust of Oregon recently added ADUs to their list of residential structures eligible to receive a monetary incentive for energy efficient design (for qualifying structures, this incentive can be ~$2K). In the course of building, and now living in, my ADU in NE Portland, I became so passionate about seeing more of them built that I have begun to offer classes to help other homeowners who want to build one. The one-day class is an on-ramp to the elaborate process of designing and building an ADU. The class will cover the spectrum of information that homeowners need to know to design and build an ADU on their property and is intended to help homeowner’s understand the ADU design, permit, management, and building process. If you’re interested in learning more about building an ADU, visit http://pdxadu.blogspot.com/p/adu-class.html or http://accessorydwellings.org. Saturday, January 21st. 9am-5pm. Register here: http://pdxadu3.eventbrite.com. Portland Parks & Recreation will soon submit their proposed budget for the next fiscal year. As directed by Mayor Adams, their budget reflects cuts of up to $3 million. This impacts important programs and services including: community centers, park garbage and restroom service, street trees, and SUN Community Schools. Childcare and translation are available, please call Elizabeth Kennedy-Wong at 503-823-5113 by January 4th. You are currently browsing the Buckman Voice blog archives for January, 2012.